As the Senate plugs away at a $15 billion jobs bill -- sorry, business tax cut! -- it's worth taking a step back and acknowledging its limitations. The bill would exempt all new hires from payroll taxes in 2010. How much money back is that? For a $60,000 worker hired on May 1, it would save about $2,500 in 2010 according to Sens. Chuck Schumer and Orrin Hatch. That's not chump change, but it leaves the vast majority of compensation up to the employer. So put yourself in the boss' shoes. If demand for your products and services is still low and the government offers to withhold $2,000 in taxes, that's probably not enough to justify a $60,000 investment in human capital. It's precisely this concern that has critics of the $15 billion bill wondering whether the only employers who will take advantage of this tax credit would have hired anyway. You can lead a horse to water, but you can't make him drink if he's not thirsty; and you can dangle tax credits in front of employers, but you can't make them bite if there's no demand for what they're selling. So let's take a look at the state of demand. We all know consumer confidence is in the toilet. But Tim Duy crunches some numbers on a relatively obscure economic indicator called "real personal income less transfer payments." Simply defined, this is what people make in income not including all money they get from the government (such as unemployment benefits). 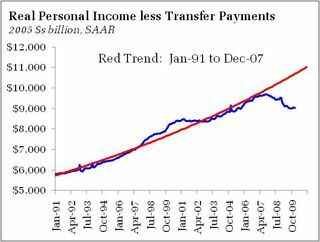 The red line is the trend line of rising personal income since 1991. The blue line is the actual data. Personal income has fallen off severely since 2007, about eight percent. Demand is weak in 2010. But without the tax breaks and transfers from the 2009 Recovery Act and follow-up unemployment benefit extensions, Americans would be without hundreds of billions dollars to spend on goods, and employers would be without hundreds of billions of dollars in revenue, meaning hundreds of billions of dollars they can't spend retaining employees. In normal times, enormous government transfer programs like unemployment benefits could distort the economy, raise the incentive not to work, and increase the tax burden on the 50-60% of Americans who pay net federal taxes. But these are not normal times; 15 million Americans are out of work because nobody will hire them, and the greatest risk to our future tax burden is that the government does nothing to lift sagging personal income. Paul Krugman had a nice piece over the weekend explaining why jobless benefits are a "good, quick, administratively easy way to increase demand, which is what we really need." What we really need is jobs. New tax credits might help. Healthy demand would help more.